Then, under “Popular Items” on the right hand side, click on “Butterfly Count”. If you’ve submitted a count using the old form, could you please re-submit using the new form? I haven’t been receiving any of your count forms, so unless you re-send the data will be lost. I’m really sorry for the extra work. Hopefully the transition will go smoothly now. Nathan Fisk writes: I spotted this Moss’s Elfin on a rock outcrop south of Thetis Lake. 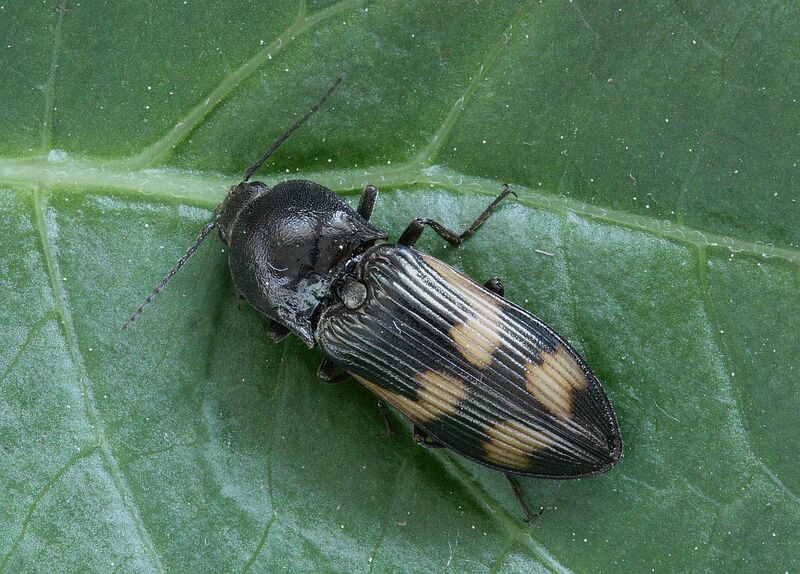 Jeremy Tatum writes: Here is a click beetle from Mount Douglas Beach Park this morning. Thank you, Scott Gilmore for identifying it for me! Jeremy adds: I saw a Satyr Comma and a Red Admiral at Lochside Drive south of Lohbrunner’s this afternoon. Bill Katz found a Cerisy’s Eyed Hawk Moth and an Anticlea vasiliata at Goldstream Park today. Jeremy Tatum writes: Here is a rather large ant from the carport of my Saanich apartment this morning. The lines on the piece of card to the left of the photograph are 1 cm apart. 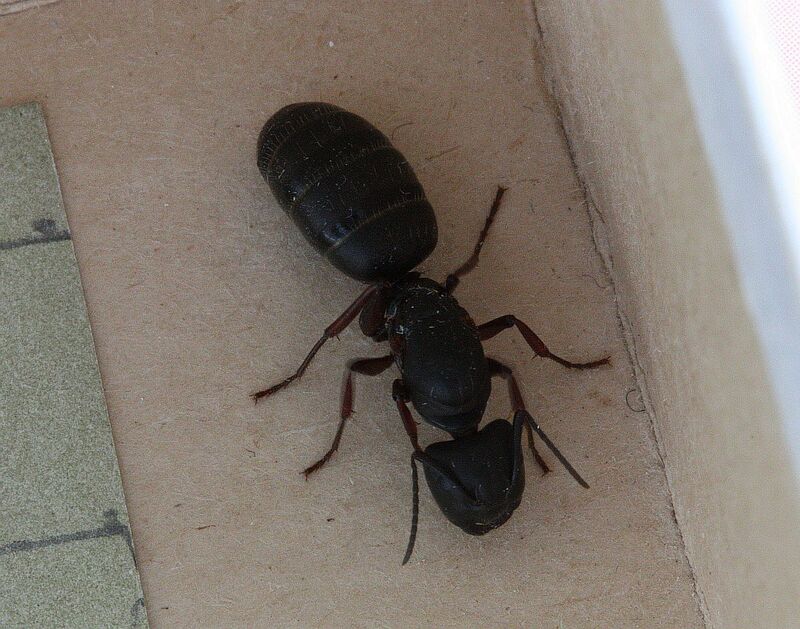 This is a species of Carpenter Ant of the genus Camponotus. 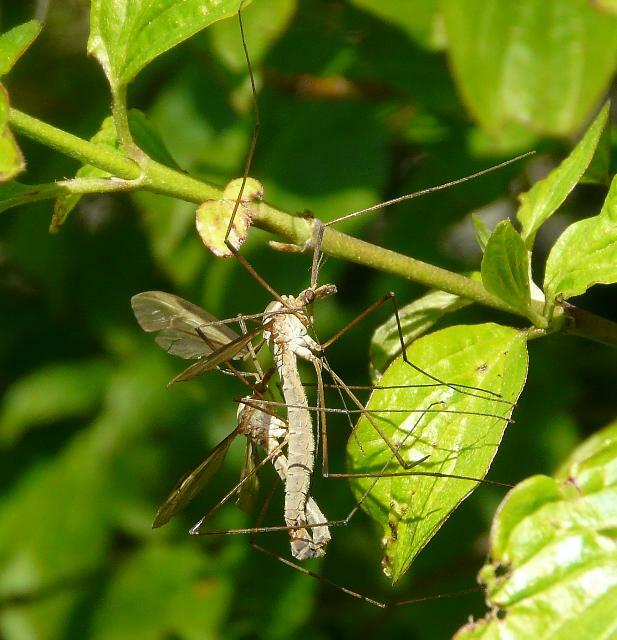 Annie Pang sends a photograph of two crane flies in copulo from Gorge Park, April 20. 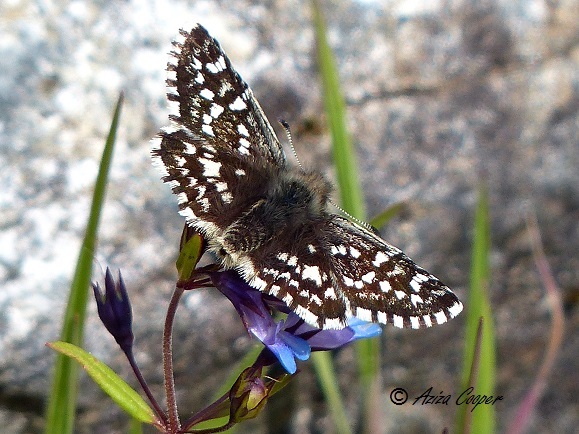 Val George writes: Yesterday, April 20, I did a butterfly count on Mount Douglas for the April survey. Conditions were ideal for these insects to fly. My count was: 9 Spring Azures, 6 Sara Orangetips, 5 Propertius Duskywings, 4 Painted Lady, 2 California Tortoiseshells, 1 Cabbage White, 1 Satyr Comma. 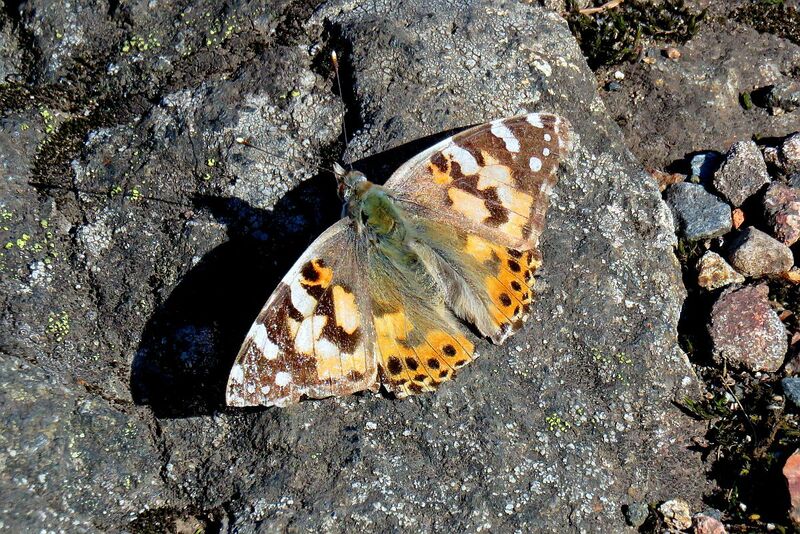 I’ve attached photos of one of the Painted Ladies and one of the California Tortoiseshells. 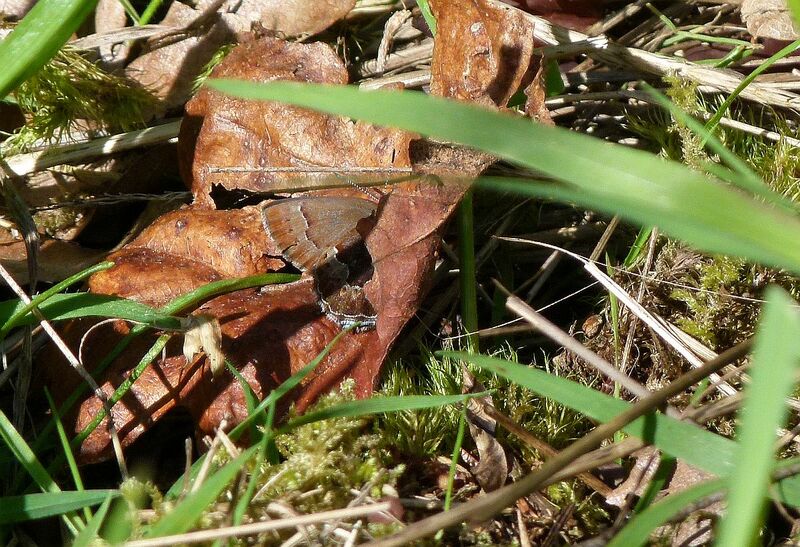 Nathan Fisk reports from Fort Rodd, April 20: Mourning Cloak, Red Admiral, Grey Hairstreak‎ all sunning in the learning meadow. Many Cabbage Whites and Western Spring Azures flitting about too. 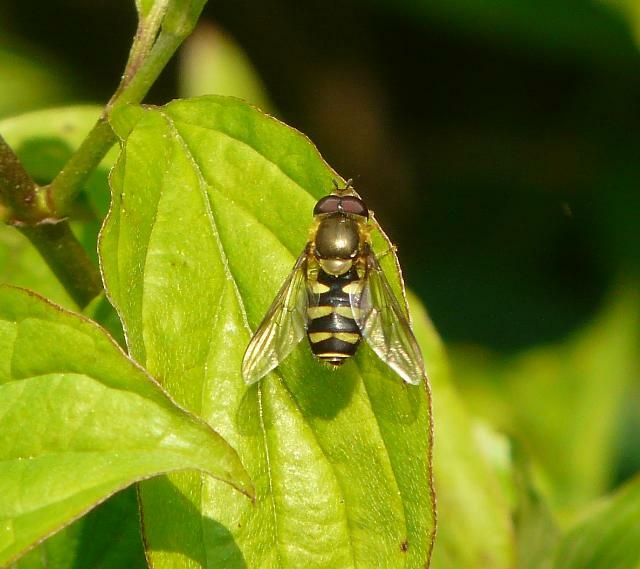 Annie Pang photographed a hoverfly at The Gorge on April 17. Syrphid expert Dr Jeff Skevington tells me that at present it is not usually possible to identify most syrphids from photographs, though he believes Annie’s is either Syrphus or Eupeodes, probably the latter. These are attractive flies to photograph, so keep ‘em coming, even if we can’t always find an identification. 7 Western Spring Azures, 5 Painted Ladies, 29 Sara Orangetips, 1 Cabbage White, 3 Grey Hairstreaks, 10 Propertius Duskywings, 4 California Tortoiseshells. 1 Mourning Cloak was seen by others hiking with Mike and me. Jeremy Tatum writes: I did my bit for the Monthly Butterfly Count today (April 20) along Munn Road. Mostly Sara Orangetips and Western Spring Azures, but also one Moss’s Elfin. For details on how to participate in the Monthly Butterfly Count, see Aziza’s notice on April 19 – there is still time for you to participate! Also, a Mourning Cloak and a California Tortoiseshell were sunning themselves on the Mount Tolmie reservoir at 4:00 p.m. on April 20. If you visit the reservoir from about 4 to 6 pm any day during the current warm and sunny spell, there’s a good chance that you’ll catch these butterflies or perhaps some other hill-topping nymphalids. 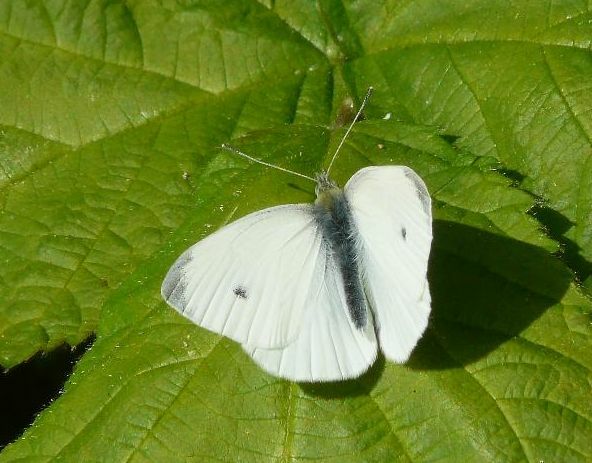 Annie Pang sends a picture of a male Cabbage White from Gorge Park, April 19. 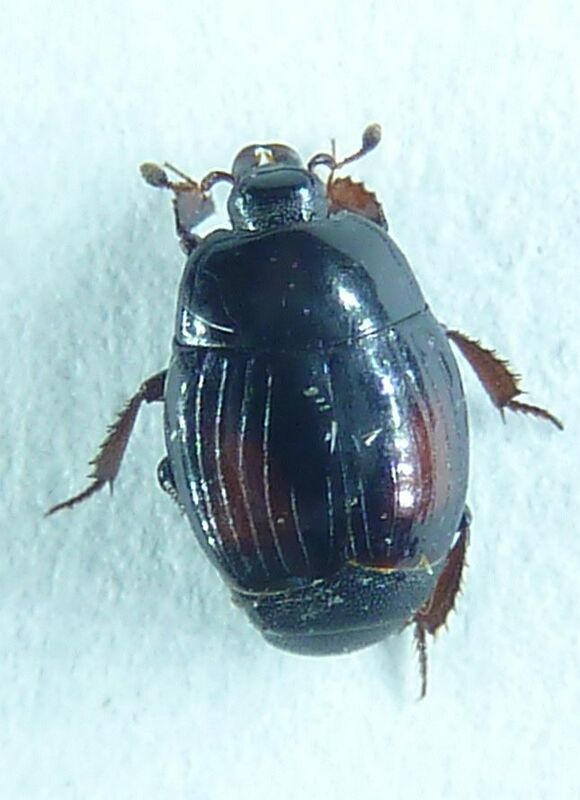 Scott Gilmore, who admits to an inordinate fondness for beetles, writes from Lantzville: With 99 families and close to 4000 species of beetles in British Columbia there is plenty of diversity. Over the weekend I was lucky enough to find members of two families I had yet to lay eyes on. On Saturday (April 18th) a buzzing sound next to my chair turned out to be a member of the Deathwatch Beetle family (Ptinidae) Vrilletta decorata. 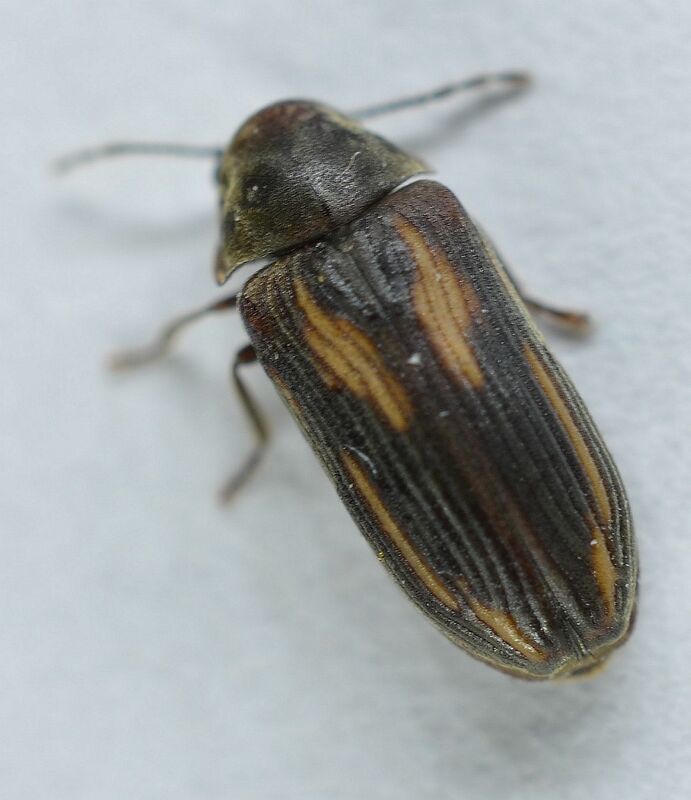 On Sunday (April 19th) I found a Clown Beetle (Histeridae) that I believe is the introduced Palaearctic species Margarinotus purpurascens which is known only in SW BC in North America. I also had a fly-by Red Admiral at a baseball field in downtown Nanaimo on Sunday afternoon. We are beginning the 2015 Butterfly Count season. As always, the count period is from the 3rd Saturday to the 4th Sunday – nine days. A warm spring has already brought the butterflies out. Then look for “Popular Items” on the right hand side, and click on “Butterfly Count”. Submit a separate form for each area you count, so I can take the higher number in case of double counting. Please let me know if you want to be removed from this list. If you know of anyone who would like to be added, please give them my email address. Thanks for submitting your sightings, and happy counting! The monthly butterfly walk is held on the first Sunday of each month – May 3rd is the next walk. We start at the summit of MountTolmie at 1pm, and decide where to go from there. The walk will be cancelled if the weather is cool or rainy. 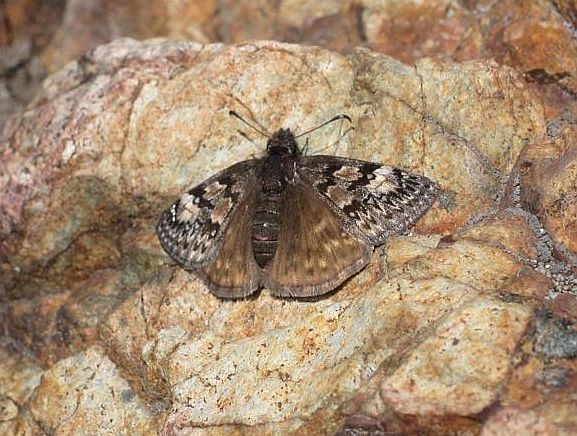 Aziza also writes: Today, Rick Schortinghuis and I found all three species of elfins, and six other species at Camas Hill. We saw the first Pale Swallowtail of the season. 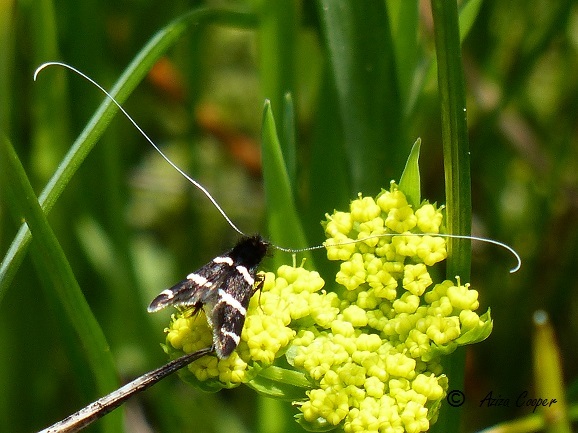 We also saw a very interesting moth, a Fairy Longhorn, with black and white barred wings and antennae far longer than its body. One Mourning Cloak was seen by Moralea soon after we left and I went to Mount Tolmie and found a Painted Lady for my tenth species of the day. 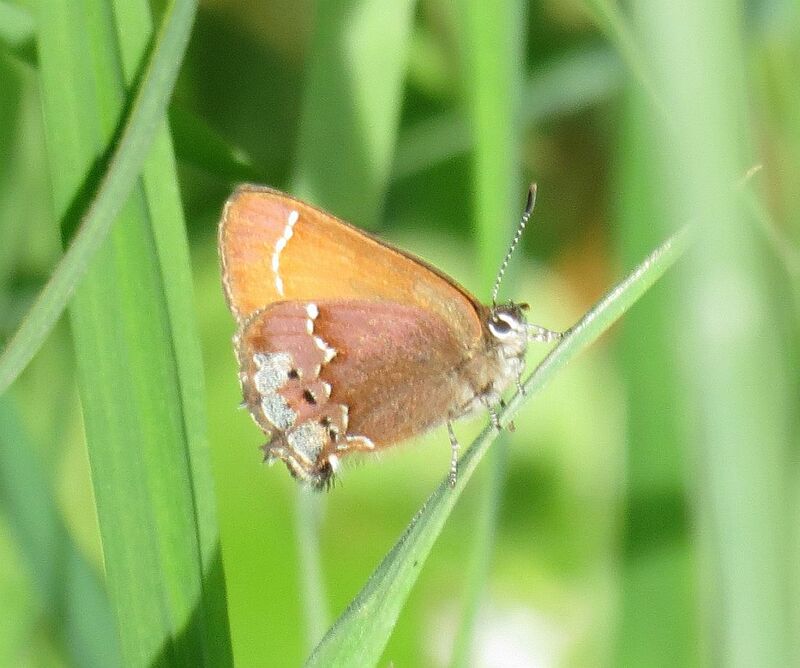 Bill Katz writes: I found a Cedar Hairstreak on Summit Hill on Sunday afternoon, April 19. Also seen were a Painted Lady, two Western Brown Elfins and many Western Spring Azures and Cabbage Whites. 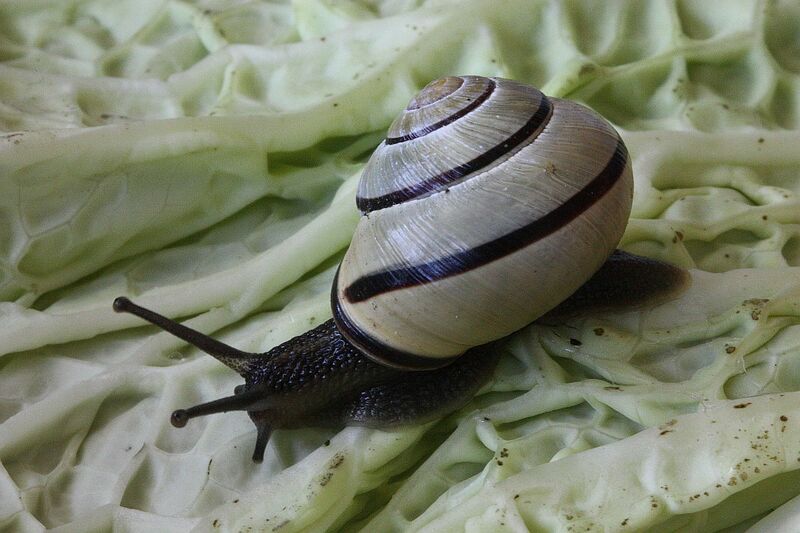 Jeremy Tatum sends a picture of a snail from the Blenkinsop Valley, and a beetle from Bow Park, April 19. 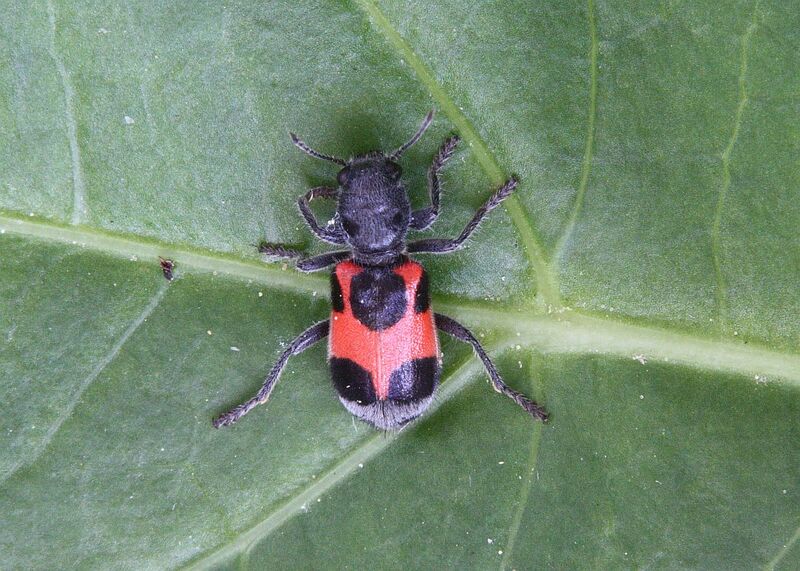 Thank you, Scott Gilmore, for identifying the beetle for me. 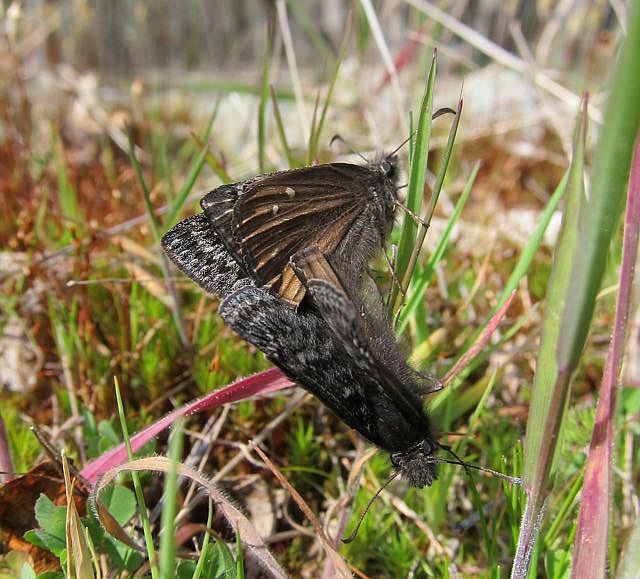 Karen Ferguson writes that the Propertius Duskywings that she saw (see April 19) were not ovipositing, but were really probing the Garry Oak buds with their proboscides. This is most interesting behaviour. Has anyone else noticed it? I wonder what they are getting from the almost-open buds. Jeremy Tatum writes: Yesterday (April 17) there were several Satyr Commas in Lochside Drive between Blenkinsop Lake and Lohbrunner’s. 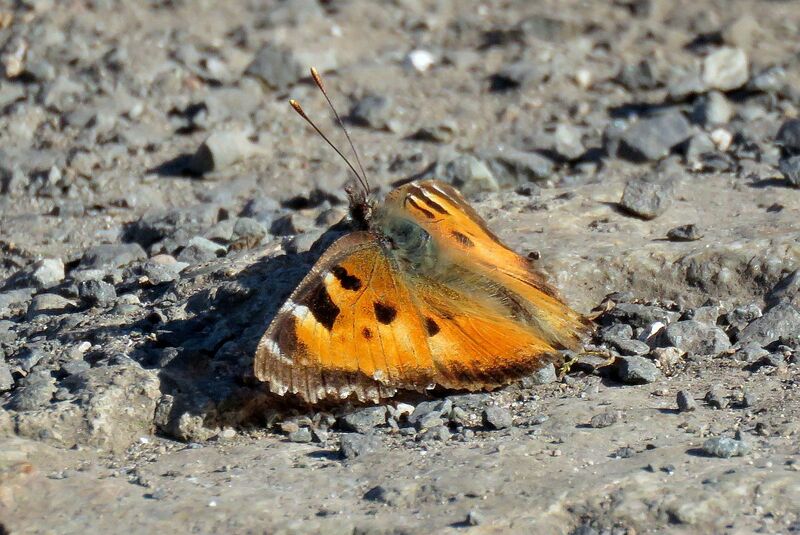 Also at 4:00 pm there was a California Tortoiseshell basking on the Mount Tolmie reservoir. Today (April 18) in the Hydro line next to Spectacle Lake I saw a Western Pine Elfin, a Mourning Cloak, and several Sara Orangetips. 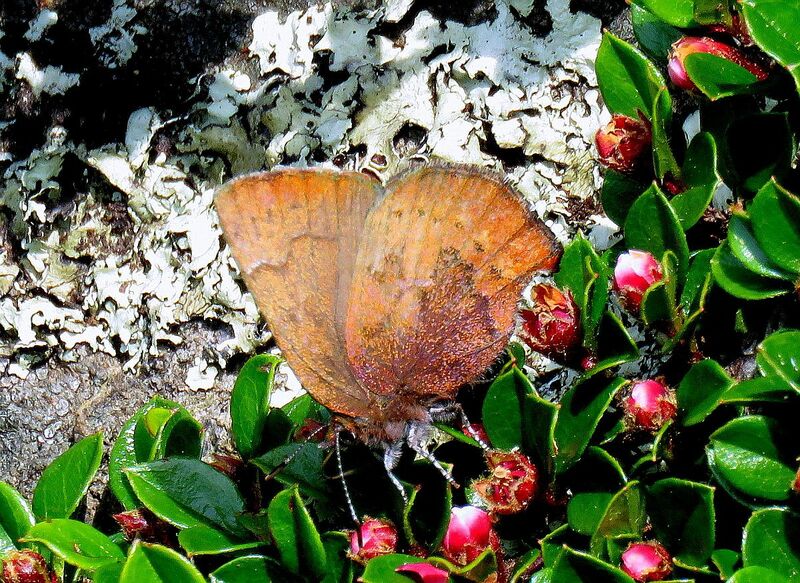 To find a Pine Elfin you must first find a few Lodgepole Pines – the butterfly is closely associated with that tree. On March 22 I posted a photograph of an ichneumonid coccon. The insect emerged from its cocoon today (April 18), and here it is. 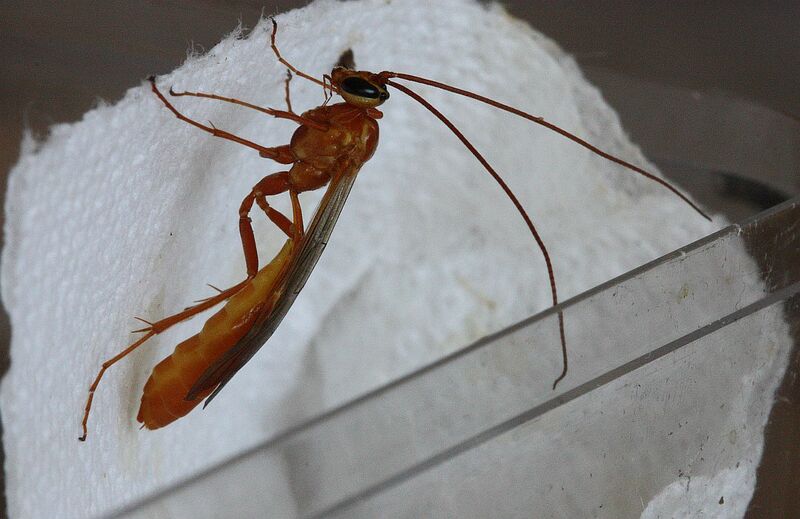 Thanks to Scott Gilmore for identifying it as Ophion sp. Val George writes: Here is a photo of a Brown Elfin from Government House this afternoon, April 18. 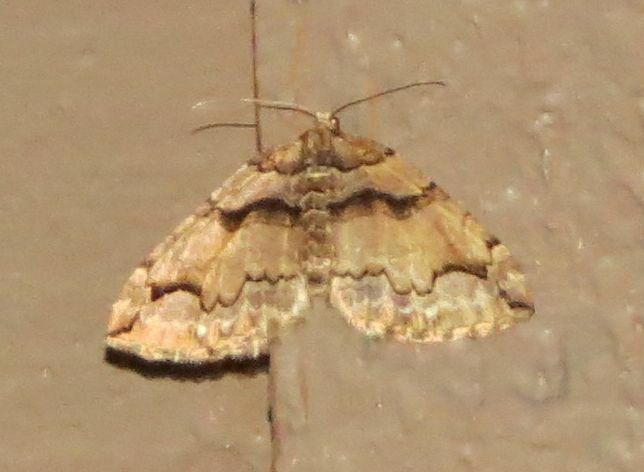 Karen Ferguson writes: Attached are photos of Propertius Duskywings that I took today (April 18). I was working in the Mt. Maxwell Ecological Reserve Garry Oak Meadows. Duskies were everywhere on the wing today and many were mating as can be seen in one of the photos. Lots of territorial activity and it was also interesting to watch them nectar on the freshly opening buds of the oak trees. The buds were barely open, certainly no flower present so I suppose there is something available for the taking. 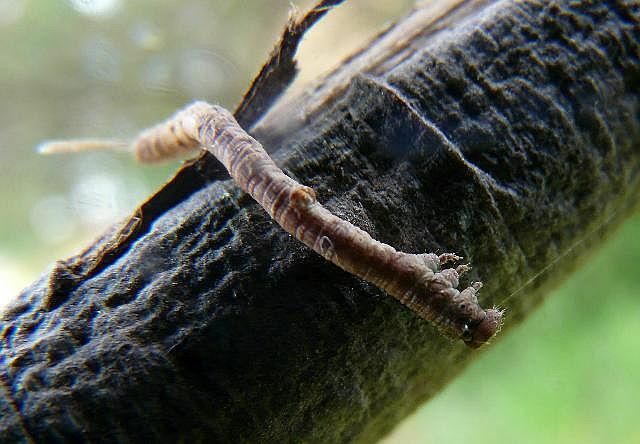 [Jeremy asks: Were they nectaring – or ovipositing?! Garry Oak is the larval foodplant. Maybe you can find some eggs!] I saw an Anna’s Hummingbird checking them out too. Also present were Sara Orangetip, Satyr Comma and a blue that was too fast for me. Jeremy comments: I think that’s the female above, the male below.